What is A soft-story structure? A Soft-story structure is an extremely common design of a multi-level structure. Commonly used for apartment buildings which park vehicles under the upper floors, Residential buildings with multiple garages in a single row, or even retail stores with large open window space and supported office or residential space above. These structures are primarily built of wood framed construction, utilizing designs preceding the 1978 California Building Code. These large openings perform poorly in an earthquake to cause structural fatigue and even structural failure (collapse) to the supported levels above. Once you know you’re the proud owner of a Soft-Story structure, an initial structural evaluation must be conducted to determine how your structure design will withstand a seismic event to a minimum requirement specific to your local ordinance. If the structure is found to meet the minimum requirements, you must submit the structural evaluation for review by your local municipality. If the evaluation finds the structure to be below the minimum requirements, you have an option to retrofit the structure to minimum compliance or demolish the structure. How to retrofit a soft-story structure? There is no short answer to this questions as each structure needs to be evaluated individually. Most designs will need a seismic frame, seismic bracing, shear walls, or a combination of these elements into a single structural design. These elements provide a corrective design to the Soft-Story structure and to achieve full compliance. The key is practical design which provides full compliance while maintaining the original intent of the space below, and without costing any more than absolutely necessary. 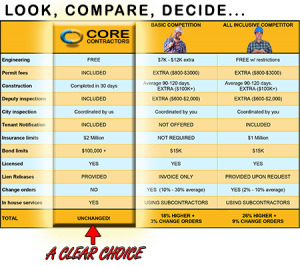 Core Contractors has designed and developed exactly the programs to meet the outlined criteria. Contract us here to have one of our engineers provide you with a no obligation free evaluation and if necessary an estimate to retrofit your structure.